Published by In These Times. Early on July 24, 1984, Dan Lafferty, a fundamentalist Mormon living near Provo, Utah, got out of bed, prayed for guidance, and then “felt prompted by the Lord to saw the barrel and stock off a 12-gauge, pump-action shotgun that he had been storing in his mother’s house.” The absurd revelation would be comical if, later that same day, Lafferty and his older brother Ron had not proceeded to murder a 24-year-old woman and her baby daughter. The victims of this crime were the wife and child of another Lafferty, Allen, the youngest of five brothers. Each of the brothers were converts to a radical sect that had split from the mainstream Church of Jesus Christ of Latter-Day Saints over its rejection of religious tenets, most notably polygamy, held dear by the church’s founding fathers, Joseph Smith and Brigham Young. Ron Lafferty, a self-proclaimed prophet, believed that he could communicate directly with God. When his sister-in-law Brenda refused to submit before the family brothers’ desire to take “plural wives,” Ron received a “removal revelation” indicating that she and her 15-month-old daughter were “children of perdition” standing in the way of God’s work. 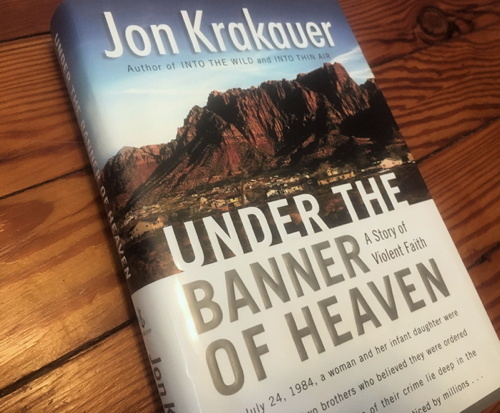 In Under the Banner of Heaven: A Story of Violent Faith, Jon Krakauer attempts to understand the history and theological principles that produced this “distinctly American brand of religious extremism.” Having grown up around Mormons in Corvallis, Oregon, Krakauer has a personal “desire to grasp the nature of religious belief,” to comprehend the “unfluctuating certainty of faith” that his playmates expressed. Krakauer structures his book with chapters that alternately tell the story of the Lafferty brothers and recount pivotal moments in the development of early Mormonism. The author finds no shortage of colorful material in either strain and crafts engaging vignettes. But bouncing between “true crime” and Church history can be jarring, sapping the story’s momentum. Yet despite feeling disjointed the book simmers in controversy. Famous for writing about mountain climbing, Krakauer cannot be described in conventional terms as a political chronicler. Nonetheless, Into Thin Air, his account of a deadly expedition up Mt. Everest that he joined in 1996, showed a mountain covered with discarded oxygen canisters, exploited sherpas, and under-experienced dilettantes willing to pay for their shot at the top. His earlier bestseller, Into the Wild, retraced the steps of a young college graduate whose Tolstoy- and Thoreau-inspired individualism compelled him to reject the norms of workaday society and ultimately led to his death in Alaska’s interior. While Krakauer’s self-identified attraction to “extremes” has always invited strong reactions, his new book’s choice of subject ensured that it would be his most contentious yet. Upon its publication the Latter-Day Saints issued a stern condemnation challenging Krakauer’s historical scholarship and calling the focus on fundamentalism an unfair smear on their religion. Both Dan and Ron Lafferty were excommunicated by the mainstream Mormons well before their fanaticism grew homicidal, the church can point out. But Krakauer argues that the church’s cultivation of pious obedience, combined with its unwillingness to openly face the darker points of its idiosyncratic past, has fueled fundamentalist fervor. Since 1890, when the Latter-Day Saints, under heavy pressure from the federal government, disavowed the practice of polygamy, extremist believers have charged the church with abandoning sacred teachings in its desire to be accepted in American society. Although still a tiny minority when compared to the 11 million Mormons worldwide, the tens of thousands who have joined fundamentalist splinter sects have endowed a handful of purported modern-day prophets with extraordinary power over their cloistered communities. Describing the prohibition on watching television or reading magazines in a prominent polygamist community in Arizona, Krakauer explains that “life in Colorado City under Rulon Jeffs,” the long-ruling patriarch, “bears more than a passing resemblance to life in Kabul under the Taliban. Uncle Rulon’s word carries the weight of law. The mayor and every other city employee answers to him, as do the entire police force and the superintendent of public schools.” Dan and Ron Lafferty are perhaps the most famous criminals to emerge out of such American theocracies, but they are definitely not the only ones. IT WOULD be too crass an analogy to compare Dan Lafferty’s belief that he “was doing God’s will” with President Bush’s June 24 statement, reported in Israel’s Ha’aretz newspaper, that “God told me to strike at al-Qaeda and I struck them, and then he instructed me to strike at Saddam, which I did.” Nevertheless, it would barely be worth considering religious fundamentalism in the United States without making the trip from Utah to Washington, D.C.
Krakauer is not the first to note, in the wake of 9/11, that our country is plenty adept at producing fanatics. Accounting for our Laffertys provides an important means of grasping the malevolence of Osama bin Laden. At the same time, a preoccupation with horrific acts of religiously inspired violence can distract from the more prevalent dangers of religious conservatism. While polygamy earned them scorn and persecution, other extreme views only gained the Mormons an honored place within the Republican Party. Today, virulent homophobia, determined anti-feminism, and a continuing legacy of racism hardly disqualify prospective public servants. Krakauer recounts in a footnote how the Latter-Day Saints can be credited with single-handedly defeating the Equal Rights Amendment in the 1970s. And, while official prohibitions on the “dark-skinned” entering the Mormon priesthood were reversed in 1978, the church still shuns miscegenation. With sociologists predicting that there will be some 300 million Mormons worldwide by 2080, the American right’s already prodigious alliance between stalwart capitalists and religious conservatives may well become more fruitful in the decades to come. Two years before the murders, when he was still an upstanding member of his local Mormon ward, Ron Lafferty was described by his neighbors as “clean, All-American.” It is this respectable, reactionary figure, more than the universally abhorred monster that he would become, that poses the real threat to tolerance in the United States. FOR THOSE NOT lodged in the most politically conservative quadrants of our society, it brings no small pleasure to see right-wing Mormons on the defensive. How is it, then, that many readers will finish Krakauer’s account feeling sympathetic to the Latter-Day Saints’ claim that the book does not treat them fairly? It can be fun to scoff at fundamentalist leaders who, after incorrectly predicting that Y2K would bring Armageddon, blame their followers’ insufficient piety for forestalling the end. Likewise, it is easy to marvel at a woman who, through a complicated series of polygamous intermarriages, becomes her own step-grandmother. But taking note of these sensationalistic details tells us little about ordinary Mormon life. Any given religion, and certainly secular society itself, has its share of kooks and fanatics, pedophiles and murderers. In Under the Banner of Heaven the fundamentalist minority becomes a straw dummy for the author’s critical view of faith in general. Throughout the book, Krakauer depicts religious conviction as essentially irrational and deluded. “Faith is the very antithesis of reason, injudiciousness a crucial component of spiritual devotion,” he writes. And in reviving religion and science as mutually exclusive options, he dredges up a long-stale debate that has lately produced few insights into questions of ethics and meaning. Krakauer’s own religious search would be more compelling had he not ignored the vast swaths of modern theology that have proposed more subtle accommodations between reason and faith. His distance from the world of belief also hurts Krakauer’s narrative. At least since Orwell, the ability to implicate one’s self in the subject at hand, and to sustain a tone of moderate self-impugning, has served as a key mark of the essayist’s credibility. Krakauer knows this. Intense personal investment—be it his close identification with the wayward young idealist in Into the Wild or his guilt over his inability to save others on his Everest expedition from dying of exposure—is what made his previous books succeed. Holding religion at arm’s length, Under the Banner of Heaven becomes voyeuristic. It is hard to blame the Mormons for objecting. In a world situation aptly described as a “clash of fundamentalisms,” many have recoiled at siding with either the Taliban’s fanaticism or Washington’s. It is equally despairing to pick between self-righteous absolutism and the abandonment of faith that Krakauer positions as the alternative. In religion as in politics, we do well to accept neither.